I’ve got several machines running Windows 10 at home and there are times when I would like to quickly remote into one of my Windows 10 machines, so that I can change some settings or install something, etc. In Windows 10, you can enable remote desktop and connect to your machine from Windows 10, 7, Vista, or XP. In this post, I will walk you through the steps to enable remote desktop on Windows 10 and then show you how to connect to your Windows 10 machine from a Windows 10 PC. Luckily, the procedure is pretty much the same as it was for older versions of Windows, but there is a new option you have to take into consideration, which I will explain later. To get started, we need to make sure a few things are setup properly, otherwise you will pull you hair out trying to figure out why Remote Desktop is not working. 1. On the Windows 10 machine you want to remote desktop into, you need to make sure the user account has a password. You also need to make sure your account is an administrator account on the system. 2. You have to make sure the firewall on Windows 10 allows remote desktop to the machine. 3. You have to enable remote desktop in the System settings. I will go through each of these steps so that you can see exactly what needs to be done in order to properly get remote desktop working. First, make sure you set a password for your administrator account. Once you have done that, go to Control Panel and click on Windows Defender Firewall. Click on Allow an app or feature through Windows Firewall and then you will scroll down until you see Remote Desktop. Make sure the box is checked. If you are unable to check it, you may have to first click on the Change Settings button at the top. Make sure it’s only enabled for the Private network; you don’t want anyone on a public network to be able to remotely connect to your computer! Once you have done that, we can go to Control Panel and click on System. Then click on Remote Settings at the top left. Now check the Allow remote connections to this computer box. Note that there is another option called Allow connections only from computers running Remote Desktop with Network Level Authentication (recommended). If you enable that, you will need to make sure you are running a remote desktop client version 6 of higher. You can check whether your version of remote desktop supports Network Level Authentication by opening remote desktop on the client machine (the computer you’ll be using to connect to Window 10) and clicking on the icon at the top left and click on About. 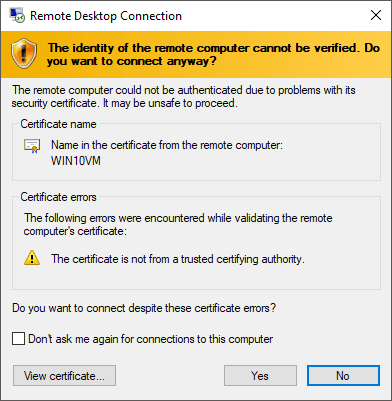 If your version of Remote Desktop Connections supports it, it will say Network Level Authentication supported. Now open remote desktop connection, type in the computer name or IP address and click Connect. You can read my previous post how to use the ipconfig command to find your IP address. If all goes well, you should get a message stating that the identity of the remote computer cannot be verified. This is not a security issue, you just have to click Yes and check the box at the bottom so it doesn’t keep asking you every time you connect. Lastly, if you want to connect to your computer from outside of your local network, you’re going to have to do a couple of more things. Read my post on how to configure your router for remote desktop. It’s quite a bit more work, so take your time and be patient. That’s pretty much it! If you have issue, try disabling Network Level Authentication and see if you can connect. Remember, as long as you have a password for the admin account, allow remote desktop through the firewall and enable remote desktop in system settings, you should be able to remote desktop into Windows 10 on the local LAN without a problem. If you are having issues, post a comment here with your specs and issues and we’ll try to help. Enjoy!